Bogotá has created a 376-kilometer (km) grid of bicycle-only lanes to promote cycling as a low-cost, zero-emission means of transport in the traffic-riddled city. The CicloRutas or bicycle routes interconnect the city center, residential areas, TransMilenio bus stations, and parks and attractions. CicloRutas have made it safe and faster to travel by bicycle in Bogotá. Average speed on a CicloRuta is 17 kilometers per hour (km/h), compared with 13 km/h for public transit during the rush hour. As a result, bicycle usage has increased to 5% by 2010 from less than 1%. The city’s transportation department estimates that about 450,000 trips are made on the bicycle routes every day. 1998: Bogotá's 1998-2001 Development Plan - Under Mayor Enrique Peñalosa, CicloRuta project is an integral part of the plan under the Mobility chapter. Cycling is a popular sport and recreational activity in Colombia. In Bogotá, more than half of households own a bicycle. Cyclists and pedestrians reclaim the city’s streets from motorists during the Ciclovía, or car-free Sundays. Institutionalizing the Ciclovía as a citywide, weekly event has helped bring about probicycle policies in urban planning and design. These include the construction of the CicloRutas. Cyclists and pedestrians take to the streets during the Ciclovía, or car-free Sundays. Bogotá needed to provide affordable and reliable modes of transport to a fast-growing population—about eight million people as of last count. The number of cars on the road was increasing, but most Bogotanos do not own a car. Many traveled by bus, which was often overcrowded and unreliable. The city also faced the twin problems of traffic congestion and vehicular pollution, which were affecting public health and the environment. Like in most cities, Bogotá’s urban planners designed roads for motor vehicles—not for walking or cycling. There was a lack of pedestrian and bicycle lanes. There was a high incidence of road accidents involving pedestrians and cyclists. Bogotá put in place the infrastructure and policies needed to promote cycling as a low-cost, convenient transport alternative to motor vehicles. Bicycles were included in the city’s urban master plan and transport strategy. As part of the plan, the city government built the CicloRuta system, which now has three cycle route networks. The Main Network links the city center and the most populated residential areas, and connects with the Secondary Network. The Secondary Network connects residential areas, parks, and attractions, and provides links to TransMilenio, the city’s bus rapid transit (BRT) system. Guarded bicycle parking facilities were provided at the TransMilenio stations. The Complementary Network comprises bike paths that run along riverbanks and wetlands surrounding the city, and links to recreational areas and external routes. In addition to bike paths along major roads, the city government widened sidewalks for pedestrians and opened public spaces for walking and cycling. It built the Alameda el Porvenir, a 17-km promenade, in a low-income neighborhood, connecting residents to schools, parks, day care centers, and a library. The government rejected a plan to build a multilane highway. In its place, it developed the Juan Amarillo Greenway, a 45-km park and bike path, which connects affluent parts of the city with poor areas. Providing segregated lanes for bicycles and buses reduced the road space for motor vehicles. The government also limited car use in the city during rush hour on weekdays through Pico y Placa or license plate restrictions, and the Ciclovia car-free Sundays and public holidays. The city government widened sidewalks for pedestrians and opened public spaces for walking and cycling. ​ Bogotá made it easier to travel by bicycle throughout the city not just by putting in place bicycle lanes but also facilities such as parking areas near bus stations. VIDEO: Interview with project proponents and/or beneficiaries. The CicloRuta system is part of a long-term sustainable transport plan that prioritizes mass transit and nonmotorized modes of transport over private vehicles. The bike paths were designed according to the topography of the city, which includes wetlands, waterways, hills, and manmade structures, such as bridges and parks. It was also necessary to build segregated bicycle lanes, which from the city’s experience, gave better protection to cyclists than the painted bicycle lanes. Building over 370 km of bike paths through a traffic-congested city was no mean feat. It took more than 10 years and several city administrations for the current CicloRuta system to be put in place. The Ciclovia, which was started by bicycle activists, has helped bring about probicycle policies in Bogota. It has also given rise to advocacy groups, such as Ciclopaseo de los Miércoles and Mejor en Bici, which promote cycling as an alternative means of transport in the city. The government prioritized mass transit and nonmotorized modes of transport over private vehicles. Advocacy groups help promote the use of bicycles as a low-cost, eco-friendly transport in the city. C40 Cities. 2011. 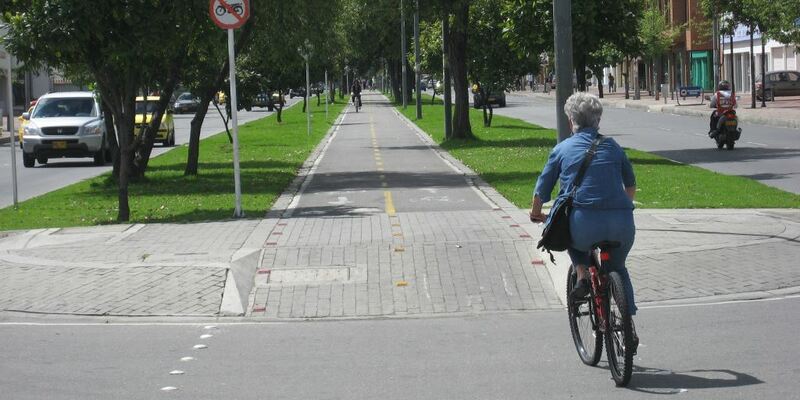 Case Study: Bogotá’s CicloRuta Is One of the Most Comprehensive Cycling Systems in the World. Ciclovía Recreativa. Ciclovía Recreativa Implementation and Advocacy Manual. C.F. Pardo. 2012. Chapter 4: Sustainable Urban Transport. In M. Peck, ed. Shanghai Manual: A Guide for Sustainable Urban Development in the 21st Century. New York: United Nations Department of Economic and Social Affairs. D. Hidalgo. 2014. Urbanism Hall of Fame: Enrique Peñalosa Leads Bogotá’s Inclusive Urban Transformation. The City Fix. 18 December. Institute for Transportation and Development Policy. 2013. ADB-CAF South-South Cooperation Virtual Study Tour Final Report. Unpublished. R.E. Berney. 2008. The Pedagogical City: How Bogotá, Colombia, is Reshaping the Role of Public. A dissertation submitted to the University of California, Berkeley. Secretaria Distrital de Movilidad (District Department of Transportation). Movilícese en Bogotá.